October 22, 2016 November 3, 2016 • Glenna G.
Our border crossing into Canada was not exactly smooth. We hadn’t checked the regulations before going, and we had to report that we had pepper spray in the car (which is illegal in British Columbia). The officers had us pull over and searched our car, asked a lot of questions, and finally let us go when they decided we weren’t a threat to national security. The drive up to Vancouver was surprisingly short. The only notable differences between Canada and the U.S. were road signs in kilometers, and cars using the right lane as the fast lane. We drove straight to Granville Island, a funky little district to the south of central Vancouver. We wandered a bit, before meeting up with our walking tour guide. She gave us a brief overview of the island’s history and how it became the trendy neighborhood that it is today. I’d advise taking a tour or doing some research before visiting, otherwise you might not be able to find all of the fascinating public art located on the island. We visited Granville Island Brewing, where we tried a very Canadian maple-flavored beer. We decided to leave our poutine quest till the following day, and grabbed a quick bite at Granville Island Public Market. 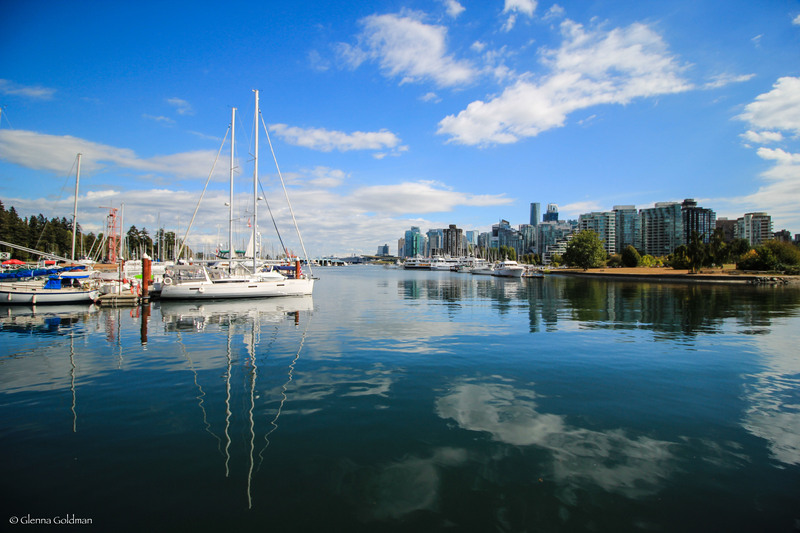 Full of restaurants, breweries, public art displays, and improv theaters, Granville Island has something for everyone. And most of all, it has great views of Vancouver Harbor! After exploring a bit more, we headed up to Gastown to find our hostel. 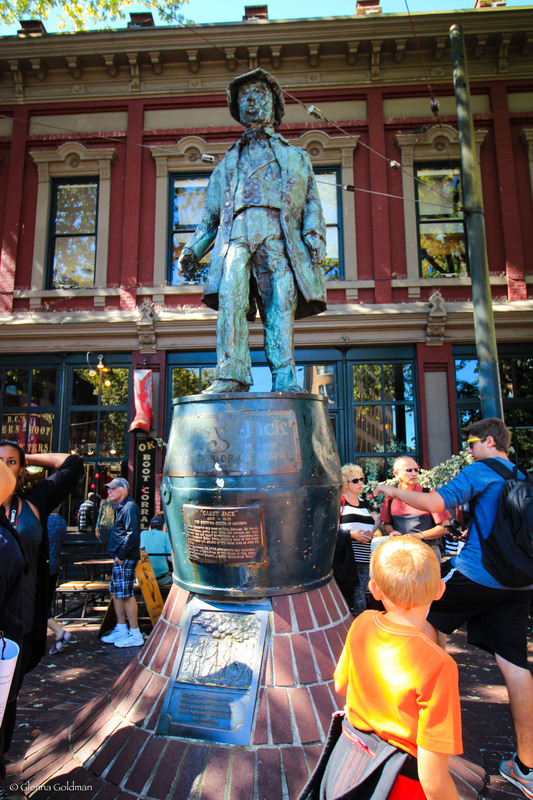 The next day we took another walking tour, this time of Gastown, the historic district we were staying in. “Gassy” Jack Deighton (“gassy” because he loved to talk) decided to open a saloon here in 1867. The town grew quickly, becoming a center of trade and recreation for the loggers and ship crews who traveled to the area. 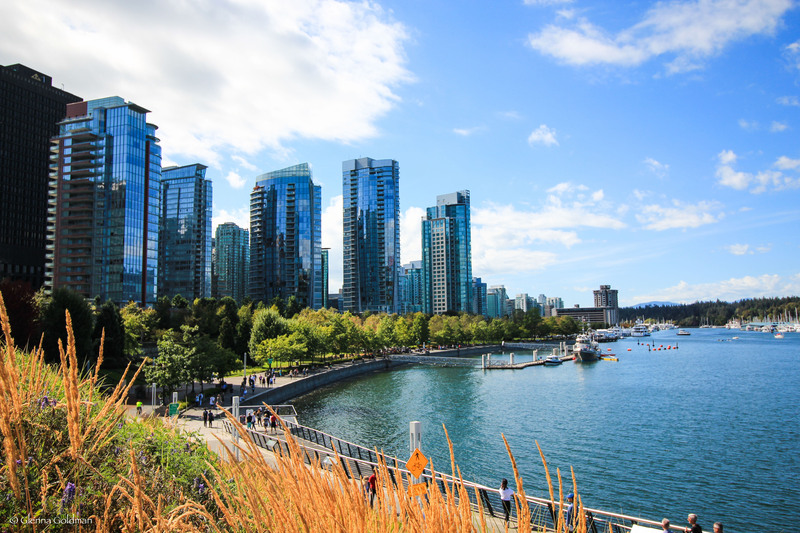 In 1886 Vancouver suffered from a devastating fire, and many of the buildings in the district were rebuilt in stone. After the Great Depression, the area became an area of rather sordid entertainment once again. In the 1960’s there was a proposal to build a highway right through Gastown. With major pushback, the neighborhood was declared a historical site in 1971. Gastown remains as a great tourist destination, full of souvenir shops (most notably the Hudson Bay Trading Company), bars, and restaurants. We thought about renting bikes for the day, but decided to just walk over to Stanley Park on the Vancouver Seawall. The wide pathway for bikes and pedestrians was fairly crowded, full of families and other tourists. We watched a cricket tournament for a little while, and then wandered over to check out the totem poles. Most people have seen totem poles at some point, but rarely so many in one place. They are traditionally carved by the First Nations people of the Pacific Northwest, to commemorate and document important events, people, or ancestry. 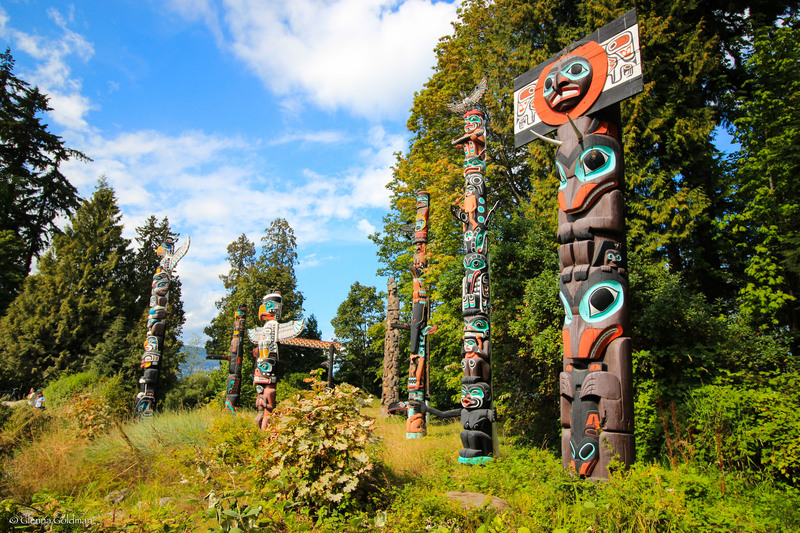 Totem poles are typically carved from red cedar, and they display a range of humans, animals, and supernatural beings. Many represent kinship in the form of family crests. Common crests include wolves, eagles, grizzly bears, thunderbirds, killer whales, frogs, ravens, and salmon. There were some helpful signs in front, describing the stories behind the poles and illustrating which animals were represented on each one. These are not original poles, but replicas, as the originals were placed in museums for preservation. We also visited the Dr. Sun Yat-Sen Chinese Gardens. We arrived just in time for a guided tour by the former director of the gardens, who still volunteers there on a regular basis. The garden was built in 1985 and 1986 by 52 master craftsmen from Suzhu, China (with help from Canadian counterparts) without the use of nails, screws, or glue. Almost all of the materials used to build the gardens were shipped from China. The gardens are a representation of a traditional Ming Dynasty scholar’s residence. Each design, material, and plant has its own symbolism, right down to the paving stones. Green tea and Mahjong lessons were provided at the end of the tour. I’d highly recommend a visit to this garden, even though it is close to a rather sketchy area of Vancouver (avoid Hastings Street altogether, as it’s a druggie homeless camp that even the guidebooks advise you to avoid). We wandered back to the hostel, stopping to watch the steam clock go off at the top of the hour. We enjoyed some poutine (French fries and cheese curds covered in gravy) as it began to rain. We’d been blessed with great weather in Seattle and Vancouver up to that point, but it seemed that the sunshine was finally at an end. We spent the rest of the time talking to our roommates in the hostel, a German on a semester exchange and an Aussie on a working visa. The German girl had just spent a few days on a boat in the harbor, and explored a few neighborhoods we’ll have to visit next time we’re in Vancouver. The next morning we packed up and walked through the rain to pick up the car and hit the road once again! 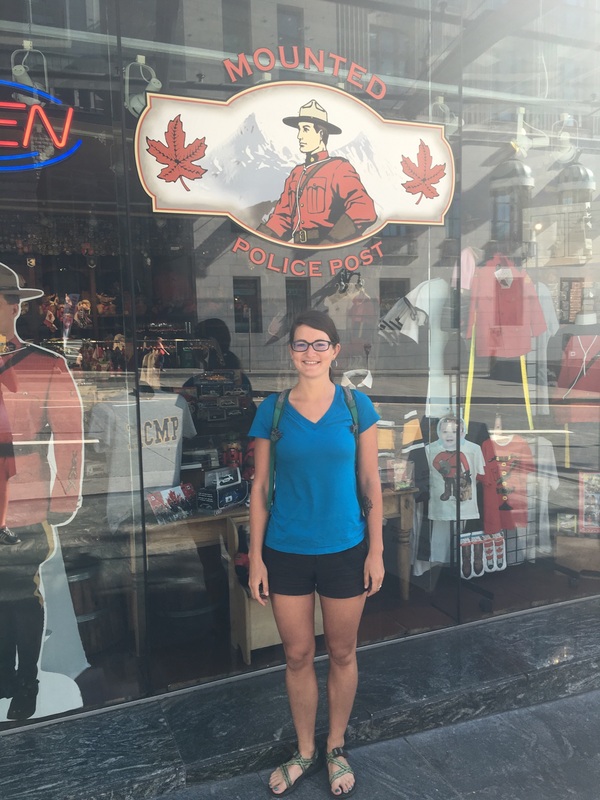 Our original plan was to spend a week up in Banff and Jasper, hiking and checking out the cool little towns nearby, and then stopping in Calgary on the way back down south. However, after checking the forecast for days beforehand, we knew our chances of even being able to see the mountains were slim. Rainstorms were predicted for days, and it was going to be below freezing at night. After looking into the costs involved, we decided it just wasn’t worth it, and we’d have to come back another time just to explore that area. The entrance fees to the parks were quite steep; camping was at least $20/night with risk of snowfall, and hostels in the areas we wanted to visit were very expensive. It’s on the wanderlust list, especially since it was just announced that entrance to Canada’s parks will be free in 2017! We left town and headed East towards Canada’s Okanagan Valley. Known as the Napa of Canada, this region has a surprisingly similar climate to the American town. Dry and generally warm, it’s a great spot to grown fruit and wine, and many Canadians have summer homes in the area. The Valley extends from the border crossing south of Osoyoos up to Vernon, Canada. We hope to drive through the entire valley at a later date, as there are hundreds of wineries to visit, and we’d love to see the lake up by Kelowna. We stopped at the Visitor’s Centre in Osoyoos, and marked off several nearby wineries with free tastings. Our favorite was Silver Sage Winery, which had tastings (12 for free!) of regular wine wine but also their specialty, a sort of fruit brandy/wine with higher alcohol content than wine, but not as much as pure liquor. At Gehringer Brothers we tasted ice wine. This is much sweeter than regular wine, as the grapes are allowed to freeze on the vine and then harvested. After asking around, we learned that Canadians can’t bring wine from the U.S. back into Canada without paying a hefty fee, but we could take Canadian wine home with no added tax, so we bought a few bottles to enjoy later. We visited a few more wineries, stopped at a fruit stand to get some fresh cherries and local apple cider, and then decided to cross over the border and camp back in the States. Our border crossing back into the U.S. was much quicker. We drove into the night, finally stopping to camp at a free campground in Idaho. The next day, we continued on to our next destination – Montana! Posted in Cities, Road Trip, Travel BlogTagged Road Trips, Travel, Travel BlogBookmark the permalink.